A very popular flavor of fingerstyle guitar playing is called “Travis Picking”, named after country guitar legend Merle Travis. Many acoustic blues guitar players were using this style of fingerpicking before him…but he gets the name. The main ingredient of this guitar fingerpicking technique is that you are going to play a bass note on every beat, usually alternating strings. A little different than the basic Folk or Classical guitar fingerpicking style I covered in a previous guitar lesson. Guitar players who use this technique often use a thumb pick to help emphasize the bass notes. I personally prefer not to use a thumb pick, but just know that’s an option. And me not using one is the exception rather than the rule. Using a thumb pick will also help give you a more pronounced bass note sound. In this guitar lesson we are going to focus on using your thumb with your 1st and 2nd fingers. So I refer to this as “2 Finger Travis Picking” You can also use your 3rd finger, but it’s definitely more common to use on your thumb and 2 fingers. Start out we will be just be alternating your thumb between the 5th and 4th strings on every beat. You may even want to count 1, 2, 3, 4 so you can establish which beat you are on. Remember the key to this whole style is the alternating bass. You need to play these bass notes on autopilot. The example below uses T to indicate the thumb is used on that string. Next you are going to add in the 3rd string with your right hand 1st finger on the & of beat 2. If you want to understand the rhythms and counting used in this guitar lesson better, be sure and check out my Rhythm Guitar Mastery course. 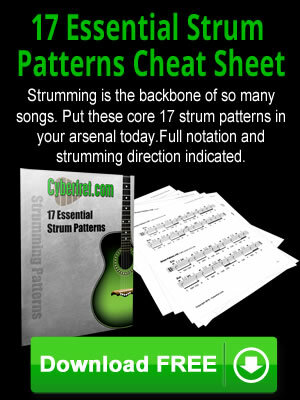 It will not only help you understand rhythms, but strumming and learning essential chords as well. The 1 and 2 in the next examples indicate which right hand finger you will use to play the string. Last you are going to add your 2nd string with your right hand 2nd finger on the & of beat 3. For more travis picking patterns, exercises and jam track, see page 2 of this lesson.